Captain Blue Jr. Captain Blue Jr.
Last I checked, this anime seemed to be unavailable, but could be viewed online at Crunchyroll. The above info came from atomofish, and was edited by yours truly (contact me). The image came from Toys N Joys. 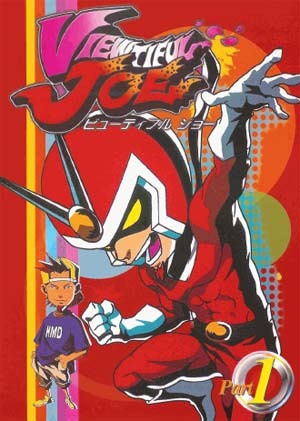 Viewtiful Joe is based on the popular video game series. The star, Joe, is a huge fan of the movie hero Captain Blue, much to his girlfriend Silvia's dismay. Worried that Joe isn't paying enough attention to her, they go out to see a movie. When they watch a Captain Blue film in a mysterious abandoned theatre, Silvia is suddenly kidnapped and taken onscreen by one of the movie villains! Joe is taken into the movie by the robot Six Machine and meets Captain Blue. However, he's gotten a bit too old for his job and passes on his powers to Joe, turning him into the superhero Viewtiful Joe! Will Joe save Silvia and prevent the villains' horrible plan to wreak havoc in the real world. You'll have to watch to find out!